Oddly enough, the older I get, the more I appreciate winter as the only time in the year when I can really relearn the benefits of silence. Going for a walk at this time of year, though chilly and muddy, is a real delight in a lot of ways – the birds and animals are all quiet, the earth underfoot is dormant, and the only sound that can be heard is the wind whistling across the fields and through the hedgerows. The view is quiet and peaceful as well – tree branches against the sky, the last rosehips on the briars, fields of turned earth under sun and cloudy sky alike. Walking today, I realised – not for the first time – that my mind is always full of noise. When my mind isn’t chattering, I have music or a movie on, and that chatters at me instead. Sometimes it is very easy to lose sight of the value of silence, that still small space inside that is the beginning of all ideas and thoughts. I used to meditate regularly, and that still small space inside became rather large, boundless, in fact, and I was calmer, more serene, less prone to stress and always hurrying everywhere. My focus and ability to concentrate were greatly improved, as well, as were my intuitive capacities. I think one of the things I will reintroduce into my life this year is regular meditation – even ten minutes per day grants long term positive effects, and as the year picks up and general busy-ness and business alike mean that I move from a slow stroll to a flat out run, that silent space inside will become a blessing. Sit comfortably, with your back straight. Close your eyes and ideally make sure the room is quiet – close the window if necessary, make sure you are warm enough. Take a slow breath in, hold for a moment, then let it back out again. Count your breaths in blocks of ten, with one being the in breath, two being the out breath, and so on and so forth. Focus only on counting your breaths. After a few weeks practice, you will find that you don’t need to consciously count any more, and your mind instead seems suspended in quiet, with no thoughts intruding, just peace. I like to set a fairly gentle alarm for after ten minutes – believe me, just starting out ten minutes is long enough and it can feel like eternity! If I know there is an alarm marking the end of the ten minutes, I am much more likely to persevere with it! Over the weeks, I tend to increase the amount of time I spend meditating by 5 minute increments, until I can do up to a half hour comfortably. Others may find that much longer benefits them, but for me personally, half an hour is enough. With practice, you can begin to introduce visualisation into the meditation from time to time, using the still space to create vivid pictures of goals you want to meet, or as ways to introduce a further dimension of calm to the time you spend meditating. I also like to do a little Tai Chi, which is much like a moving meditation – one of my goals for this year is to get back to class regularly and learn some more of the moves, with the end target of learning one whole routine of around 160 moves. This can be a delightful way to start off the day, followed by a quiet cup of tea in the sunshine. Anyone who has met me in person is probably well aware that I have the bad habit of living life on the run, and find it very hard to slow down – meditation and Tai Chi are two of the few things that help! 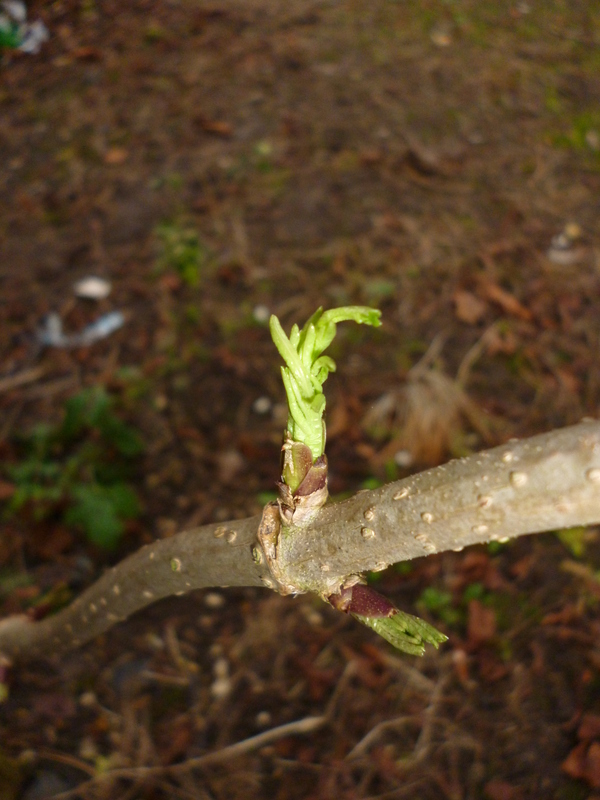 Walking today, I noticed a few slightly disconcerting signs of spring starting to emerge. 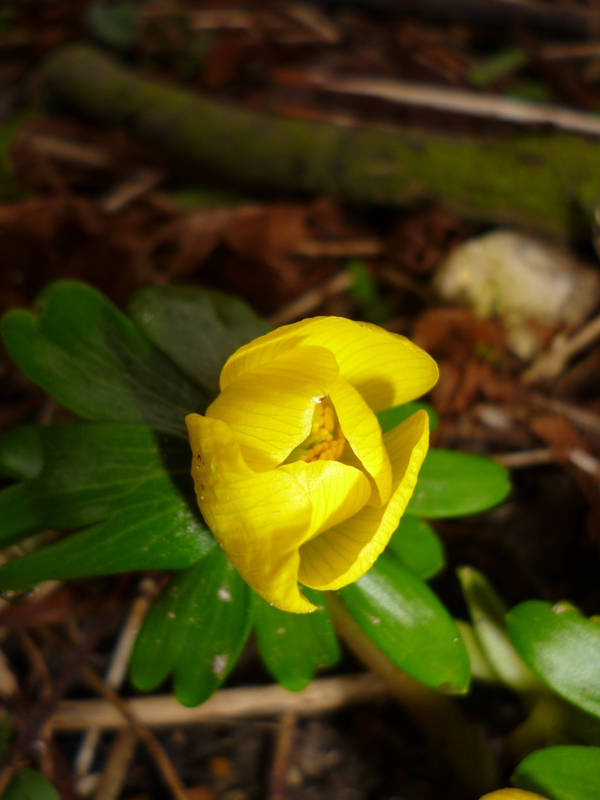 Aconites are flowering under the Horse Chestnut on the front lawn, almost brash against the earthen brown – not so disconcerting, as they tend to appear early anyway. 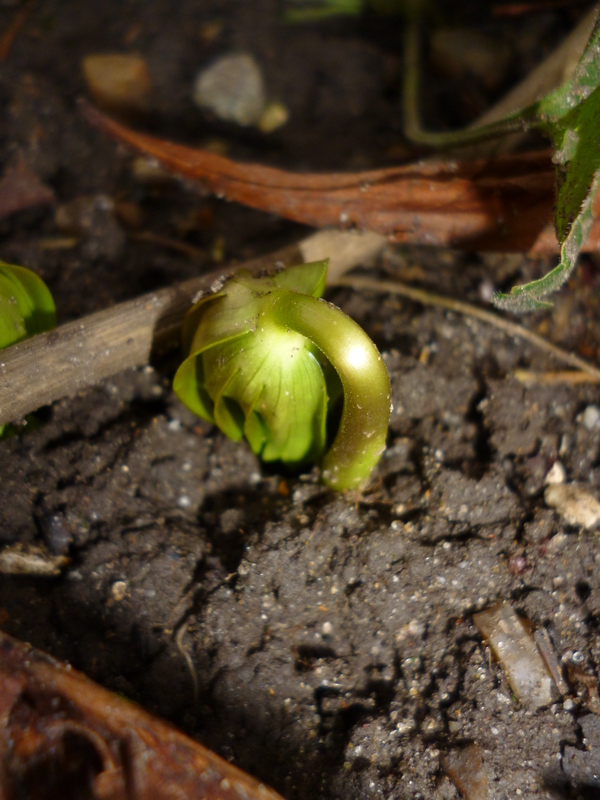 The Elder sapling outside my front door has noticeable buds on it that are beginning to leaf out, and down the local footpaths, shoots of Daffodils, Snow Drops and Lords and Ladies are starting to emerge. I just hope that either this mild weather continues so that the plants can carry on as they have been, or that the temperatures dip again for another month, so that the tender shoots and flowers hold off for a little longer! Thank you. I was just beginning to think about Spring today to cheer me up as it is so bleak here, in France. And collecting pictures of the first flowers of Spring to pin them together in my kitchen comes February!